In Governor Brown’s Approval of bill AB2480, California took a major step in making its expansive water supply system even larger by including source watersheds within its water infrastructure management and funding scheme. In re-imagining a more comprehensive view of the state’s water supply infrastructure, which has canals that reach as far away as Wyoming, politicians are looking a little closer to home and reconsidering the critical role of the watersheds surrounding domestic rivers and streams in ensuring water security. The bill, introduced by member of the Assembly Richard Bloom (R – Santa Monica) states “It is hereby declared to be the established policy of the state that source watersheds are recognized and defined as integral components of California’s water infrastructure”. Source watersheds are those that fill important drinking water reservoirs that serve major California cities such as San Francisco and Los Angeles. The Sierra Nevada, for example, provides 60% of the state’s domestic water supply. 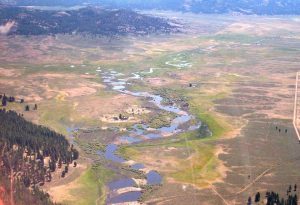 These watersheds also support diverse fish and wildlife populations, many of which are facing population declines such as the CA Roach (Hesperoleucus symmetricus), Hardhead fishes (Mylopharodon conocephalus), and Sierra Nevada Red Legged Frog (Rana sierrae). With the passage of AB2480, natural watershed resources such as streams, meadows and forests now join canals, dams and levees as water resources that can receive funding from infrastructure bonds. These natural resources play a major role in water retention, transport, and quality, and are now being recognized as integral water resources and eligible for financing previously available only to man-made structures. (1) Upland vegetation management to restore the watershed’s productivity and resiliency. (2) Wet and dry meadow restoration. (3) Road removal and repair. (5) Conservation of private forests to preserve watershed integrity through permanent prevention of land use conversion and improved land management, achieved through, and secured with, conservation easements. (6) Other projects with a demonstrated likelihood of increasing conditions for water and snow attraction, retention, and release under changing climate conditions. Next story Time for reflection: Does stream restoration work?